I'm exploring this cookbook slowly, mostly because several of the recipes require two days to prepare (one day to prepare the beans and the next day to prepare the meal), and I rarely have my day together enough to start dinner after breakfast. Nevertheless, these tasty recipes are good motivation to do some meal planning and get organized. They are great! Here's what I especially like about the recipes: most of the time, I have all of the ingredients on hand except for one or two items (like a butternut squash) that I can easily pick up. I keep a moderately well-stocked vegetarian pantry, but I'm no foodie so I don't have rare spices or special legumes or peppers on hand. I have substituted jalapenos for thai peppers and cayenes (which my grocery store doesn't carry) several times with good results. 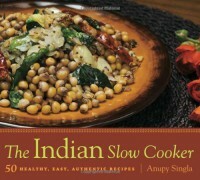 My other Indian cuisine cookbook keeps calling for amchoor powder, which I cannot find anywhere that I normally shop. I appreciate a cookbook that is willing to go at least a little way toward using ingredients available to most of the people in its market. Secondly, the Spicy Punjabi Eggplant with Potatoes (p. 92) is every bit as amazing as promised. It's now my favourite home-cooked Indian dish. I am always hoping for one recipe this delicious when I buy a new cookbook, so even if I never tried another recipe from this book I would consider it a good purchase.